The Lamborghini Strike C 115 offers class-topping power, style and versatility, while the quiet FARMotion engine and silentblock platform mounts ensure comfort on par with many wheeled models. The generous ground contact area (over 1.6 m²), 6-roller undercarriage and low centre of gravity allow this tractor to work safely even on very steep gradients. An exclusive, sophisticated design reflecting the latest evolution in the Lamborghini style language, combined with extraordinary attention to detail, lend the Strike C 115 a sense of unique and instantly recognisable elegance. Boasting state of the art technological solutions and impressive power for class-beating productivity, this tractor keeps on working efficiently and tirelessly even in the toughest working conditions. The most powerful in its class. With 113 HP of power, the FARMotion equipping the Strike C 115 is not only the most potent engine in this class but also - thanks to pioneering solutions developed specifically for agriculture - one of the most fuel efficient. With common rail injection system with injection pressures up to 2,000 bar, turbo-intercooled forced induction with wastegate valve, and a viscostatic fan, and attaining Stage III B emissions compliance with just a DOC catalytic converter, the Strike C 115 is an impressive package. All of this power is on tap at just 2,000 rpm, while the torque curve is specifically optimised for agricultural applications. Silky smooth for maximum productivity. The Lamborghini Strike C 115 is available with a choice of two mechanical transmissions with synchronised reverse shuttle, offering 12+12 or 16+16 speeds. The generously sized (13") sintered plate clutch and extremely robust transmission gears and steering clutches are a guarantee of extraordinary reliability even when the tractor is used for heavy draft tasks. The extremely precise controls and wet disc brakes ensure supreme accuracy when manoeuvring, even when working on very steep gradients and in extremely rough terrain conditions. The 50 l/min main pump of the hydraulic system feeds oil to the 2,800 Kg rear lift and to the double acting distributors (available in optional configurations with up to 10 couplers). 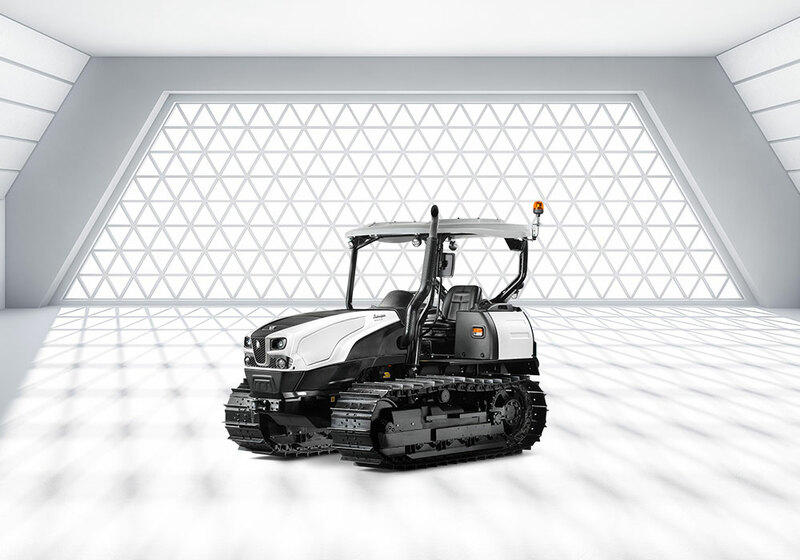 The system includes an additional 25 l/min pump dedicated to the steering clutches, to ensure progressive, precise manoeuvring even with the engine at idle speed and while other hydraulic utilities are in use. The PTO is just as versatile, and comes as standard with an interchangeable output flange shaft, a proportionally engaged electrohydraulic clutch and 540 rpm and 540 ECO speed modes, while a 1000 rpm mode is available as an option. The comfort of a wheeled tractor on a crawler. With a modern, ergonomic driver zone, with a flat platform mounted on 4 silentblocks, and a seat with effective mechanically sprung (or optional air sprung) suspension, the Strike C 115 offers impeccable comfort in all conditions. The lubricated track chains offered as an option not only minimise power absorption and wear but also significantly reduce noise. The controls are organised in accordance with the latest standards for ergonomics let you work at peak productivity for longer without fatigue, while the anti-glare instrument panel and high visibility indicator lamps put you in complete control of all the functions of the tractor at all times. Exhaust Gas Recirculation. Exhaust gas recirculation: includes a specific radiator for cooling recirculated exhaust gases, which would otherwise compromise combustion efficiency and increase consumption.